Ads Pulled from Ingraham Show After She Mocked Parkland Survivor - Integration Through Media ....! 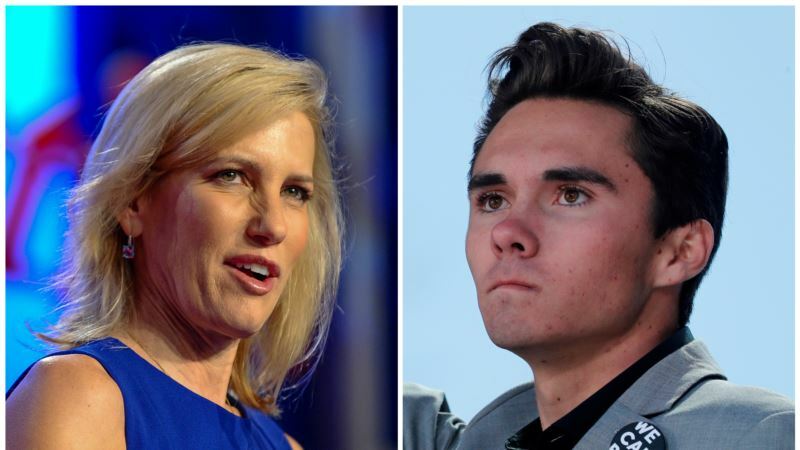 (VOA): At least three companies said Thursday they were pulling advertisements from a Fox News show hosted by conservative pundit Laura Ingraham, heeding a call from a teenage survivor of the Florida school massacre whom Ingraham mocked on Twitter. Parkland student David Hogg, 17, tweeted a list of a dozen companies that advertise on The Ingraham Angle and urged his supporters to demand that they cancel their ads. Hogg is a survivor of the Feb. 14 mass shooting that killed 17 people at Marjory Stoneman Douglas High School in the Parkland suburb of Fort Lauderdale. Since then, he and other classmates have become the faces of a new youth-led movement calling for tighter restrictions on firearms. Hogg took aim at Ingraham's advertisers after she taunted him Wednesday on Twitter, accusing him of whining about being rejected by four colleges to which he had applied. On Thursday, Ingraham tweeted an apology "in the spirit of Holy Week," saying she was sorry for any hurt or upset she had caused Hogg or any of the "brave victims" of Parkland. "For the record, I believe my show was the first to feature David … immediately after that horrific shooting and even noted how 'poised' he was given the tragedy," Ingraham tweeted, adding that Hogg was welcome back for another interview. But her apology did not stop at least three companies from parting ways with her show. U.S. celebrity chef Rachael Ray's pet food line Nutrish, travel website TripAdvisor and online home furnishings seller Wayfair Inc all said they were canceling their advertisements. Wayfair Wayfair said it supports open dialogue and debate, but "the decision of an adult to personally criticize a high school student who has lost his classmates in an unspeakable tragedy is not consistent with our values," it said in a statement. Nutrish Replying to Hogg's boycott call, Nutrish tweeted: "We are in the process of removing our ads from Laura Ingraham's program." A representative for the pet food line did not immediately respond to a request for further comment. TripAdvisor CNBC cited a TripAdvisor spokesman as saying the company does not condone "inappropriate comments" made by Ingraham that in its view "cross the line of decency." TripAdvisor representatives did not immediately reply to a request for comment. Ingraham's show runs on Fox News, part of Rupert Murdoch's Twenty-First Century Fox Inc.